Ladies and Gentleman, I am delighted to announce my new book ‘Vampires Love Sausage Too’ will be released on May 28th by Twickenham Press. Rather than rant too much about how brilliant I am, why not just read the extract below. “Is that a sausage in your mouth or are you just pleased to see me?” Count Yussuf Larkee turned around to see a man dressed as a biker, wearing more leather than the average cow, attired with a handlebar moustache of such dimensions that it looked as if the mans lips were struggling to bear the weight of it. The Count knew that it was now or never. Could he tell? Should he tell? Inside he felt it would be wonderful if he could, even momentarily unburden himself from his secret. But how could this man understand? This pulsating, sweating stinking man know what it feels like to spend your whole life living a lie? Surely there was no one on earth who felt the way he did. Something clicked in his mind, and with all the assurance of a Dodo on a diving board he took a deep breath and did the unspeakable. “No, it’s the severed arm of a car crash victim I picked up earlier. I’m not eating it by the way, I’m just sucking the blood out of it. See, I’ve, erm I mean I’m, well, I, am a…”‘ mumbled the Count weakly. ”Where did you buy that sparkly eye make up, you look so good I could eat you?”‘ Before he could utter a word in response, the Count’s nerves took control and he turned into a bat. 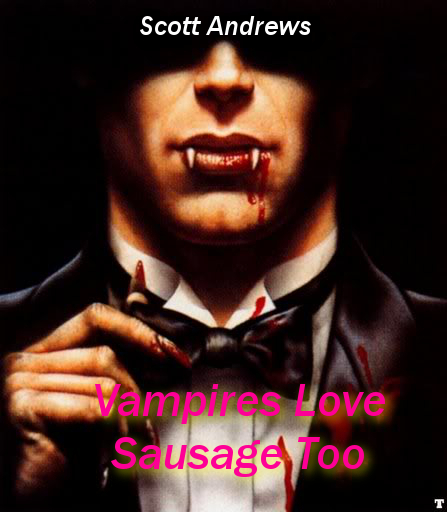 ‘Vampires Love Sausage Too’ tells the story of the first vampire to come out of the closet. It features sequins, stereotypes, awful writing, no plotline to speak of and a great deal of homo-eroticism. In other words it’s guaranteed to be an instant hit. If you don’t believe me check out the great cover design some bloke, somewhere in a dark cubicle of an office made for me. And if that doesn’t convince you, here are a few reviews from some well-known celebrities that I have never ever met and have definitely never read this book. So there you have it, get ordering, get sparkly and get ready. Thank you in anticipation of your support, and I look forward to your feedback. I’m sure together we can make ‘Vampires Love Sausage Too’ a bestseller.